This spring is special in the university city of Lund. Lundaspexarna’s flagship, Uarda (the student variety show), celebrates 100 years. To think that this “studentspex” has been produced like every five years, and more, since 1908 (!) at AF-borgen in Lund is almost hard to grasp. For me personally, this is my 10th, AND LAST, spex (like I’ve said so many times before). 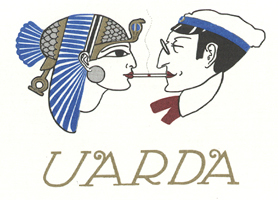 This classic Uarda logo was drawn by illustrator Harald Sjövall. I wanted to try to leave an impression by making a theater program booklet out of the ordinary, so I attracted my old friend Alfred Gunnarsson to the project. Alfred was head of the carnival computer game “8 Bitar – Jakten på Karnevalsbiljetten”. This guy knows printing like the back of his palm and is a creative son of a mother, so I was extremely happy to join forces with him. Together we came up with the longest program booklet ever (“as long as the show, 2:40”), rolled up like a very long piece of parchment. My role was to illustrate it in the spirit of Sjövall. One of the main challenges of making this “booklet” was to think up ideas for all the ads for our sponsors. Several members of the creative ensemble helped us in this process. The tricky part was to make it all into a coherent piece of work. I came up with the idea to try to feature as many of the characters from the play in the ads, and draw them like Egyptian 2D wall paintings (almost). I think this helped the look of the program a great deal. Not all ads had characters. These two simple and effective ones were designed by Alfred. The greatest ad however was the one without an illustration. 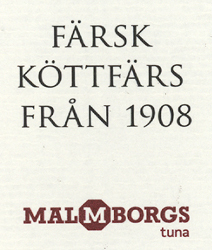 “Fresh meat from 1908”. It’s even funnier if you’re Swedish. I love companies with a sense of humor.